Golden Feather Wattle ( Acacia trachyphloia ). The Caterpillars grow to a length of about 3 cms. 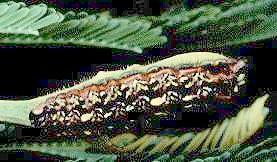 The pupa is shiny black, and develops under bark or in a crevice. It too is visited by ants. The pupal period was from January to the following December. The male and female adults are similar, except that the wings of the female are more rounded. The fore and hind wings are black or dark brown on top, with a white temen, and an orange mark in the middle of each wing, The inner edge of the orange mark has a black border. The hind wings also have scarlet border by the tails. The undersides are bluish grey, with each fore wing marked by a black termen, black discal spot and a black outer line. The hind wings underneath have black markings and a scarlet border. The wingspan is about 3 cms. The eggs are pale green, round and flattened, with a diameter of about 1 mm. They are usually laid in small groups (up to five) on twigs of a young foodplat. although the status of some is controversial.